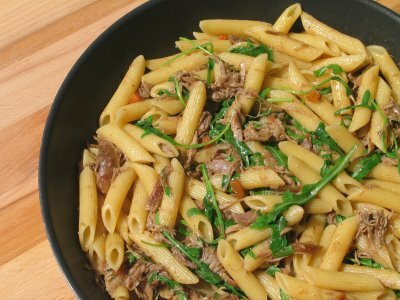 I know, I know…Duck pasta might be a bit much for some of our readers, but give it a try some time! A little duck goes a long way with flavor. Salt and pepper the duck meat. Roast in the oven for 45 minutes. Cook pasta until al dente and then drain and set aside. In a heavy saucepan, heat the butter, flour, garlic, mustard, and broth until it reaches a boil. Stir in the cream, salt, rosemary, bay leaf, and chopped onion. Set the olive oil, parmesan, arugula and parsley aside. Stir often for ten minutes. You may want to add an additional tablespoon of flour to the sauce to thicken more. If so, stir more. Shred the leg of duck with a fork. Combine the olive oil, pasta, parmesan, parsley and arugula with the sauce and meat. Stir until sauce is evenly distributed.